Canola meal (CM) use in animal nutrition is limited due to the inclusion of various antinutritional factors (ANF). 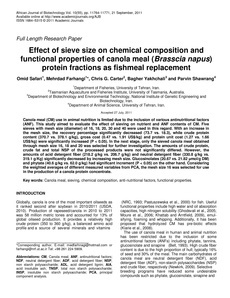 This study aimed to evaluate the effect of sieving on nutrient and ANF contents of CM. Five sieves with mesh size (diameter) of 16, 18, 20, 30 and 40 were used in this regard. With an increase in the mesh size, the recovery percentage significantly decreased (73.7 vs. 18.3), while crude protein content (370.7 vs. 378.1 g/kg), gross cost (0.47 vs. 1.91 US$/kg) and protein unit cost (1.27 vs. 1.66 US$/kg) were significantly increased (P < 0.05). In the next stage, only the sieved canola meal obtained through mesh size 16, 18 and 20 was selected for further investigation. The amounts of crude protein, crude fat and total NSP of the processed products were not significantly differed. However, the amounts of acid detergent fiber (218.2 g/kg vs. 206.7 g/kg) and neutral detergent fiber (330.8 g/kg vs. 319.1 g/Kg) significantly decreased by increasing mesh size. Glucosinolates (20.67 vs. 21.82 μmol/g DM) and phytate (40.6 g/kg vs. 62.0 g/kg) had significant increment (P < 0.05) on the other hand. Considering the weighted averages of different measured variables from PCA, the mesh size 16 was selected for use in the production of a canola protein concentrate.